Licensed under Creative Commons Attribution-Share Alike 3.0 (Martin23230). The Americas (also collectively called America) comprise the totality of the continents of North and South America. Together, they make up most of the land in Earth's western hemisphere and comprise the New World. Along with their associated islands, they cover 8% of Earth's total surface area and 28.4% of its land area. The topography is dominated by the American Cordillera, a long chain of mountains that runs the length of the west coast. The flatter eastern side of the Americas is dominated by large river basins, such as the Amazon, St. Lawrence River / Great Lakes basin, Mississippi, and La Plata. 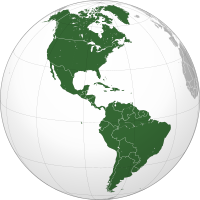 Since the Americas extend 14,000 km (8,700 mi) from north to south, the climate and ecology vary widely, from the arctic tundra of Northern Canada, Greenland, and Alaska, to the tropical rain forests in Central America and South America. Humans first settled the Americas from Asia between 42,000 and 17,000 years ago. A second migration of Na-Dene speakers followed later from Asia. The subsequent migration of the Inuit into the neoarctic around 3500 BCE completed what is generally regarded as the settlement by the indigenous peoples of the Americas. The first known European settlement in the Americas was by the Norse explorer Leif Ericson. However, the colonization never became permanent and was later abandoned. The voyages of Christopher Columbus from 1492 to 1502 resulted in permanent contact with European (and subsequently, other Old World) powers, which led to the Columbian exchange. Diseases introduced from Europe and West Africa devastated the indigenous peoples, and the European powers colonized the Americas. Mass emigration from Europe, including large numbers of indentured servants, and importation of African slaves largely replaced the indigenous peoples. Decolonization of the Americas began with the American Revolution in 1776 and Haitian Revolution in 1791. Currently, almost all of the population of the Americas resides in independent countries; however, the legacy of the colonization and settlement by Europeans is that the Americas share many common cultural traits, most notably Christianity and the use of Indo-European languages: primarily Spanish, English, Portuguese, French, and to a lesser extent Dutch. 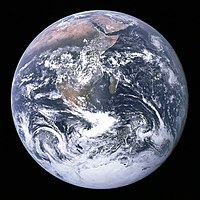 The population is over 1 billion, with over 65% of them living in one of the three most populous countries (the United States, Brazil, and Mexico). As of the beginning of the 2010s, the most populous urban agglomerations are Mexico City (Mexico), New York (U.S.), Sao Paulo (Brazil), Los Angeles (U.S.), Buenos Aires (Argentina) and Rio de Janeiro (Brazil), all of them megacities (metropolitan areas with ten million inhabitants or more). Arlberg is a mountain range or massif between Vorarlberg and Tyrol in Austria. The highest peak is the "Valluga" at 2,811 metres (9,222 ft). The name Arlberg derives from the tradition of the "Arlenburg", who are said to have once established themselves on the Tyrolean side of the Arlberg passes (1,793 m above sea level). Another story derives the name from the "Arlenbushes" that are very numerous here. There is no mountain with the name "Arlberg" proper. Popular places and famous ski resorts at the Arlberg are Lech, Zürs, Stuben, St. Christoph and St. Anton. The name of the state of Vorarlberg is derived from the mountain Arlberg, which is located in front of the Arlberg, from the point of view of the Holy Roman Empire as well as the Swiss Confederation and the castle of the Habsburgs. Licensed under Creative Commons Attribution-Share Alike 3.0 (Harald Krichel). Berlin (, German: [bɛɐ̯ˈliːn]) is the capital and the largest city of Germany as well as one of its 16 constituent states. With a population of approximately 3.7 million, Berlin is the second most populous city proper in the European Union and the seventh most populous urban area in the European Union. Located in northeastern Germany on the banks of the rivers Spree and Havel, it is the centre of the Berlin-Brandenburg Metropolitan Region, which has roughly 6 million residents from more than 180 nations. Due to its location in the European Plain, Berlin is influenced by a temperate seasonal climate. Around one-third of the city's area is composed of forests, parks, gardens, rivers, canals and lakes. First documented in the 13th century and situated at the crossing of two important historic trade routes, Berlin became the capital of the Margraviate of Brandenburg (1417–1701), the Kingdom of Prussia (1701–1918), the German Empire (1871–1918), the Weimar Republic (1919–1933) and the Third Reich (1933–1945). Berlin in the 1920s was the third largest municipality in the world. After World War II and its subsequent occupation by the victorious countries, the city was divided; East Berlin was declared capital of East Germany, while West Berlin became a de facto West German exclave, surrounded by the Berlin Wall (1961–1989) and East German territory. Following German reunification in 1990, Berlin once again became the capital of all of Germany. Berlin is a world city of culture, politics, media and science. Its economy is based on high-tech firms and the service sector, encompassing a diverse range of creative industries, research facilities, media corporations and convention venues. Berlin serves as a continental hub for air and rail traffic and has a highly complex public transportation network. The metropolis is a popular tourist destination. Significant industries also include IT, pharmaceuticals, biomedical engineering, clean tech, biotechnology, construction and electronics. Modern Berlin is home to world renowned universities, orchestras, museums, entertainment venues and is host to many sporting events. Its urban setting has made it a sought-after location for international film productions. The city is well known for its festivals, diverse architecture, nightlife, contemporary arts and a high quality of living. Since the 2000s Berlin has seen the emergence of a cosmopolitan entrepreneurial scene. Licensed under Creative Commons Attribution-Share Alike 3.0 (Bullshark44). Boston (pronounced BOSS-tən) is the capital city and most populous municipality of the Commonwealth of Massachusetts in the United States. It is also the seat of Suffolk County, although the county government was disbanded on July 1, 1999. The city proper covers 48 square miles (124 km2) with an estimated population of 673,184 in 2016, making it the largest city in New England and the 22nd most populous city in the United States. The city is the economic and cultural anchor of a substantially larger metropolitan area known as Greater Boston, a metropolitan statistical area (MSA) home to a census-estimated 4.8 million people in 2016 and ranking as the tenth-largest such area in the country. Alternately, as a combined statistical area (CSA), this wider commuting region is home to some 8.2 million people, making it the sixth-largest in the United States. Boston is one of the oldest cities in the United States, founded on the Shawmut Peninsula in 1630 by Puritan settlers from England. It was the scene of several key events of the American Revolution, such as the Boston Massacre, the Boston Tea Party, the Battle of Bunker Hill, and the Siege of Boston. Upon U.S. independence from Great Britain, it continued to be an important port and manufacturing hub as well as a center for education and culture. The city has expanded beyond the original peninsula through land reclamation and municipal annexation. Its rich history attracts many tourists, with Faneuil Hall alone drawing more than 20 million visitors per year. Boston's many firsts include the United States' first public school (Boston Latin School, 1635), first subway system (Tremont Street Subway, 1897), and first public park (Boston Common, 1634). The Boston area's many colleges and universities make it an international center of higher education, including law, medicine, engineering, and business, and the city is considered to be a world leader in innovation and entrepreneurship, with nearly 2,000 start-ups. Boston's economic base also includes finance, professional and business services, biotechnology, information technology, and government activities. Households in the city claim the highest average rate of philanthropy in the United States; businesses and institutions rank among the top in the country for environmental sustainability and investment. The city has one of the highest costs of living in the United States as it has undergone gentrification, though it remains high on world livability rankings. The Brocken, also sometimes referred to as the Blocksberg, is the highest peak of the Harz mountain range and also the highest peak of Northern Germany; it is located near Schierke in the German state of Saxony-Anhalt between the rivers Weser and Elbe. Although its elevation of 1,141 metres (3,743 ft) is below alpine dimensions, its microclimate resembles that of mountains of about 2,000 m (6,600 ft). The peak above the tree line tends to have a snow cover from September to May, and mists and fogs shroud it up to 300 days of the year. The mean annual temperature is only 2.9 °C (37.2 °F). It is the easternmost mountain in northern Germany; travelling east in a straight line, the next prominent elevation would be in the Ural Mountains in Russia. The Brocken has always played a role in legends and has been connected with witches and devils; Johann Wolfgang von Goethe took up the legends in his play Faust. The Brocken spectre is a common phenomenon on this misty mountain, where a climber's shadow cast upon fog creates eerie optical effects. Today the Brocken is part of the Harz National Park and hosts a historic botanical garden of about 1,600 alpine mountain plants. A narrow gauge steam railway, the Brocken Railway, takes visitors to the railway station at the top on 1,125 m (3,691 ft). FM-radio and television broadcasting make major use of the Brocken. The old television tower, the Sender Brocken, is now used as hotel and restaurant. It also has an observation deck, open to tourists. Licensed under Creative Commons Attribution-Share Alike 3.0 (Jleon and Mcshadypl). Chicago ( or ), officially the City of Chicago, is the third-most populous city in the United States. With over 2.7 million residents, it is also the most populous city in both the state of Illinois and the Midwestern United States. It is the county seat of Cook County. The Chicago metropolitan area, often referred to as Chicagoland, has nearly 10 million people and is the third-largest in the U.S. Chicago has also been called a global architecture capital. In terms of wealth and economy, Chicago is considered one of the most important business centers in the world. Chicago was incorporated as a city in 1837, near a portage between the Great Lakes and the Mississippi River watershed, and grew rapidly in the mid-nineteenth century. After the Great Chicago Fire of 1871, which razed several square miles and left more than 100,000 homeless, the city made a concerted effort to rebuild on the damage. The construction boom accelerated population growth throughout the following decades, leading Chicago to become among the five largest cities in the world by 1900. During this period Chicago is noted for its contribution to urban planning and zoning standards, new construction styles (including the Chicago School of architecture), the embracement of the City Beautiful Movement, and the eventual creation of the steel-framed skyscraper. Positioned along Lake Michigan, the city is an international hub for finance, commerce, industry, technology, telecommunications, and transportation: O'Hare International Airport is the second-busiest airport in the world when measured by aircraft traffic; the region also has the largest number of U.S. highways and rail road freight. In 2012, Chicago was listed as an alpha global city by the Globalization and World Cities Research Network, and ranked seventh in the world in the 2016 Global Cities Index. Chicago has the third-largest gross metropolitan product in the United States—about $640 billion according to 2015 estimates. The city has one of the world's largest and most diversified economies with no single industry employing more than 14% of the workforce. In 2016, Chicago hosted over 54 million domestic and international visitors, a new record making it one of the top visited cities in the nation. Landmarks in the city include Millennium Park, Navy Pier, the Magnificent Mile, Art Institute of Chicago, Museum Campus, the Willis (Sears) Tower, Museum of Science and Industry, and Lincoln Park Zoo. Chicago's culture includes the visual arts, novels, film, theater, especially improvisational comedy, and music, particularly jazz, blues, soul, hip-hop, gospel, and house music. There are many colleges and universities in the Chicago area; among these, Northwestern University, University of Chicago, and the University of Illinois at Chicago are classified as "highest research" doctoral universities. Chicago has professional sports teams in each of the major professional leagues. The city has many nicknames, the best-known being the Windy City and Chi-Town. A city map is a large-scale thematic map of a city (or part of a city) created to enable the fastest possible orientation in an urban space. The graphic representation of objects on a city map is therefore usually greatly simplified, and reduced to generally understood symbology. Depending upon its target group or market, a city map will include not only the city's transport network, but also other important information, such as city sights or public institutions. Cuba, officially the Republic of Cuba (Spanish: República de Cuba ), is a country comprising the island of Cuba as well as Isla de la Juventud and several minor archipelagos. Cuba is located in the northern Caribbean where the Caribbean Sea, the Gulf of Mexico, and the Atlantic Ocean meet. It is south of both the U.S. state of Florida and the Bahamas, west of Haiti, and north of Jamaica. Havana is the largest city and capital; other major cities include Santiago de Cuba and Camagüey. Cuba is the largest island in the Caribbean, with an area of 109,884 square kilometres (42,426 sq mi), and the second-most populous after Hispaniola, with over 11 million inhabitants. Prior to Spanish colonization in the late 15th century, Cuba was inhabited by Amerindian tribes. It remained a colony of Spain until the Spanish–American War of 1898, which led to nominal independence as a de facto United States protectorate in 1902. As a fragile republic, Cuba attempted to strengthen its democratic system, but mounting political radicalization and social strife culminated in the dictatorship of Fulgencio Batista in 1952. Further unrest and instability led to Batista's ousting in January 1959 by the July 26 Movement, which afterwards established a dictatorship under the leadership of Fidel Castro. Since 1965, the state has been governed by the Communist Party of Cuba. A point of contention during the Cold War between the Soviet Union and the United States, a nuclear war nearly broke out during the Cuban Missile Crisis of 1962. Cuba is one of the few remaining Marxist–Leninist socialist states, where the role of the vanguard Communist Party is enshrined in the Constitution. Independent observers have accused the Cuban government of numerous human rights abuses, including arbitrary imprisonment. Culturally, Cuba is considered part of Latin America. It is a multiethnic country whose people, culture and customs derive from diverse origins, including the aboriginal Taíno and Ciboney peoples, the long period of Spanish colonialism, the introduction of African slaves, and a close relationship with the Soviet Union in the Cold War. Cuba is one of the world's last planned economies and its economy is dominated by the exports of sugar, tobacco, coffee and skilled labor. According to the Human Development Index, It is described as a country with high human development and is ranked the eighth highest in North America, though 67th in the world. It also ranks highly in some metrics of national performance, including health care and education, and is the only country in the world to receive WWF's definition of sustainable development. Cuba receives assistance from Venezuela, amounting to over 20% of its GDP for 2008–2010, similar to the aid flows from the Soviet Union in 1985–1988. Licensed under GNU Free Documentation License (chensiyuan). The Dolomites (Italian: Dolomiti [doloˈmiːti]; Ladin: Dolomites; German: Dolomiten [doːloːˈmɪtn̩]; Venetian: Dołomiti [doɰoˈmiti]: Friulian: Dolomitis) are a mountain range located in northeastern Italy. They form a part of the Southern Limestone Alps and extend from the River Adige in the west to the Piave Valley (Pieve di Cadore) in the east. The northern and southern borders are defined by the Puster Valley and the Sugana Valley (Italian: Valsugana). The Dolomites are nearly equally shared between the provinces of Belluno, South Tyrol and Trentino. There are also mountain groups of similar geological structure that spread over the River Piave to the east – Dolomiti d'Oltrepiave; and far away over the Adige River to the west – Dolomiti di Brenta (Western Dolomites). There is also another smaller group called Piccole Dolomiti (Little Dolomites) located between the provinces of Trentino, Verona and Vicenza (see map). The Dolomiti Bellunesi National Park and many other regional parks are located in the Dolomites. In August 2009, the Dolomites were declared a UNESCO World Heritage Site.